Art And Consequence: A Talk With China's Controversial Ai Weiwei : The Two-Way The artist behind Beijing's Olympic Stadium is now in government custody and artists all over the world are planning protests in support of his release. NPR's Laura Sydell spoke with the controversial artist in 2008. Even then, he was pushing boundaries. 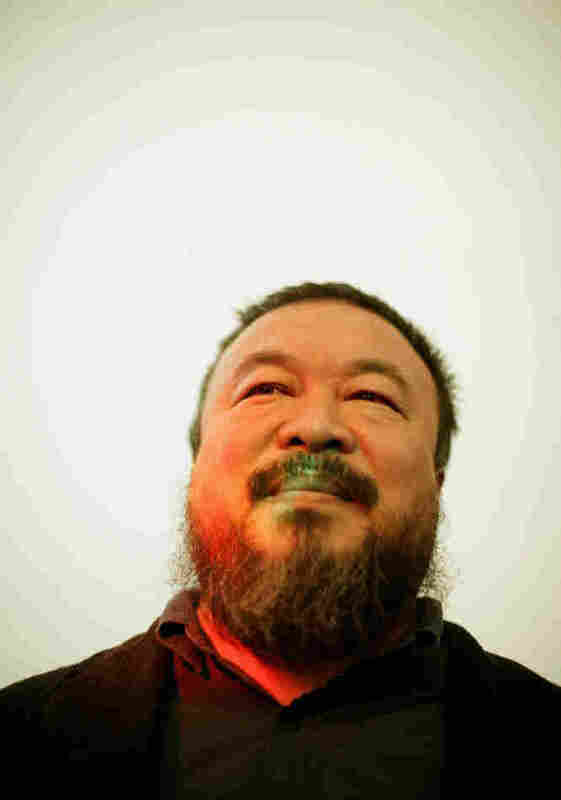 Ai Weiwei, one of China's most controversial artists, looks on during the 'So Sorry' exhibition opening at 'Haus der Kunst' on October 11, 2009 in Munich. The protesters will be bringing chairs to sit on. They aren't worried about getting tired. The design of the protest is a homage to a piece by Ai that was exhibited in 2007 at Documenta 12, a major arts festival in Kassel, Germany. In the artist's characteristically subversive style, he challenged the boundaries of art and brought 1,001 late Ming and Qing Dynasty wooden chairs and recruited average Chinese citizens to come to Germany to sit in the carefully arranged chairs. For the protest, called 1,001 chairs for Ai Weiwei, people are asked to bring a chair and as the The Aldrich Contemporary Art Museum puts it, "sit peacefully in front of Chinese embassies and consulates in support of his immediate release." Ai is probably best known to Americans as part of the design team of the 2008 Bejing Olympic stadium, a building everyone called "The Bird's Nest." Ai very publicly quit the project right before the Olympics telling Reuters that he was disgusted that the stadium was a proud sign of China's development. I had the opportunity to meet Ai while I was in China in May of 2008 right before the Olympics. 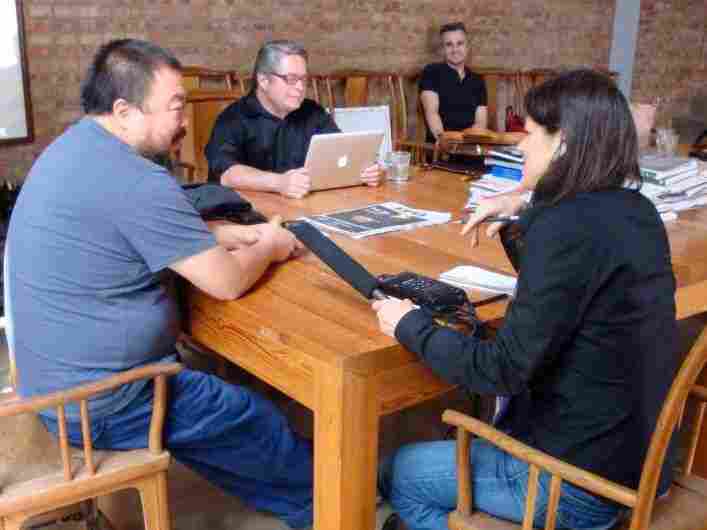 I met him at his sprawling and spare studio complex in Bejing, which he had designed himself. Studio assistants worked quietly in the background, a few partially feral cats roamed the yard and one of his dogs barked intermittently as we spoke. At the time Ai was keeping a blog. Every day, the artist put up as many as six posts and hundreds of photos documenting his life. As we sat at the corner of a long wood table, I put a microphone in front of Ai as he snapped photos of me, which he later posted. Ai, was often under official surveillance. So he was poking fun at authorities. "They can just read my blog," he said. As one of China's most famous artists Ai, had been asked by Sina, among the country's major Internet portals, to keep the blog. Ai said Sina hoped he would contribute to the front page with a stream of celebrity gossip. 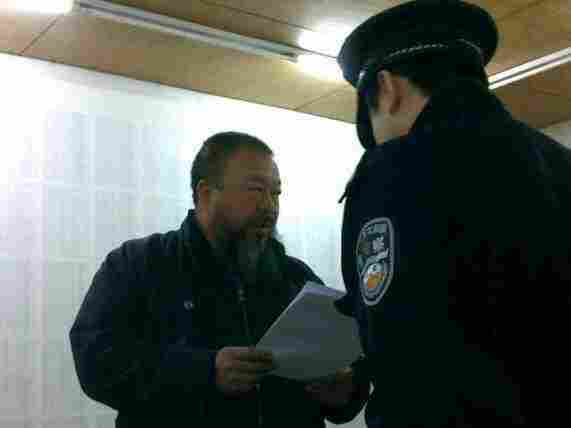 Ai Weiwei was visited by police three days before he was detained. 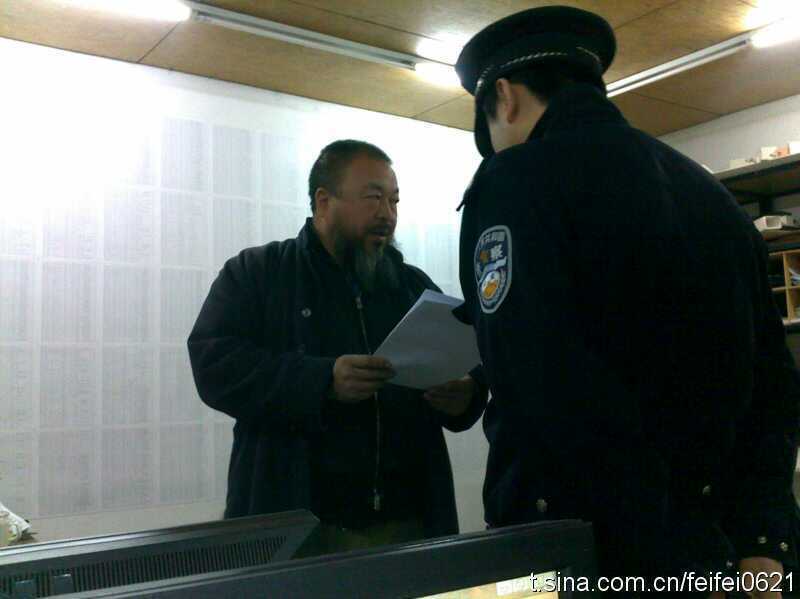 Instead, Ai's blog criticized everything from sanctioned cruelty to animals to the Chinese-built railroad to Tibet, which he saw as part of an effort to destroy Tibetan culture. Sina removed the blog from the front page. They asked Ai to tone it down because China's Internet police had given them warnings. Ai was defiant. He told them, "I will never do self censorship. Either you close it up or I will continue putting those things up." When I met Ai, it was shortly after the major earthquakes in Sichuan. The official media was dripping with praise for government and military efforts to save people and there was a drum beat of national pride. Ai's blog called into question turning a national tragedy into an excuse to whip the country into a patriotic fervor. At the time, it seemed like Ai's reputation as a great international artist gave him some protection. Especially given the light the Olympics were shining on China. As Ai saw it, if he had special status as a well known artist, he should use it. He said, "If that is true that means I really have to work harder to make them more conscious of my existence because there are so many people who cannot have a voice." Ten months after the earthquake, the Chinese government still said it did not know how many students had perished in neglected government school buildings. Ai began to survey victims and collect names himself. He collected more than 5,200 names. Shortly after that the government released its own figures — a little more than 5,300. Not too long after that Ai's blog was shut down. He also suffered a beating at the hands of police. 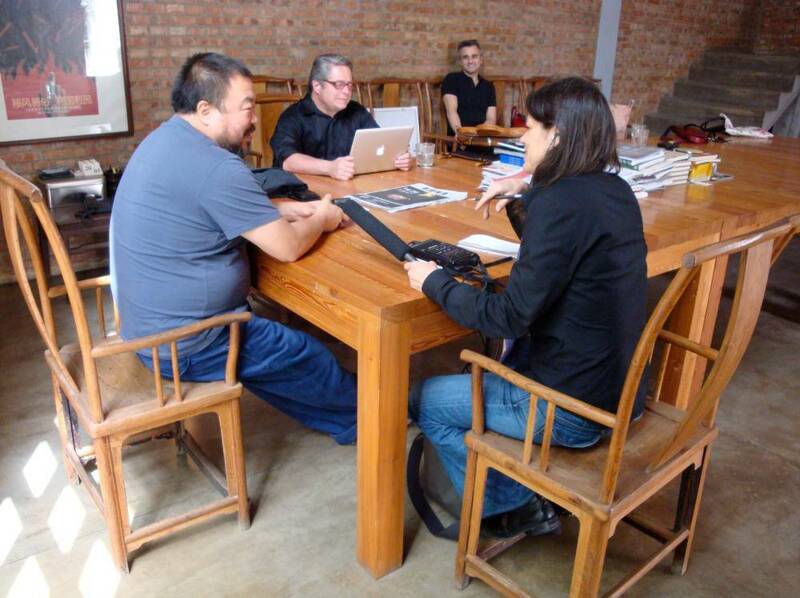 NPR's Laura Sydell interviews Ai Weiwei in 2008. What struck me about Ai was his refusal to think about the consequences of what he was doing. "How can you predict what's in a dictator's mind?" he asked. "You know if you really think about them you are already a victim of them." Although Twitter was banned in China after they shutdown his blog, Ai used it garnering nearly 80,000 followers. His last tweet was on April 3. Ai is among several prominent activists who were recently arrested. The list now includes Ai's lawyer. Western experts believe that China is fearful that activists want to launch a "Jasmine Revolution," similar to the ones in the Middle East. In my interview, nearly two years ago, Ai seemed optimistic that China would eventually open up. "We are changing. They are changing," he said. "I don't worry too much about the future. I have to do what I have to do today." Laura Sydell is NPR's Digital Arts Correspondent.